Lucifer criticizing the writing in the Bible. Your Bible gets more wrong than it does right. The Bible generally refers to the texts of Judaism and Christianity. The main direct references in Supernatural to the Bible relate to the prophecy regarding the Apocalypse in the Book of Revelation, which is the last book in the Christian New Testament. While being attacked by ghosts from their past, Bobby is able to deduce the brands on the spirits represent the Mark of the Witness. He tells Sam and Dean that due to the spirits being witness to the unnatural, which led to their deaths, they have been branded and factor into a prophecy known as the Rise of the Witnesses. He reveals that the prophecy comes from the Book of Revelation and is a sign of the Apocalypse. "And there fell a great star from heaven, burning like a torch, and it fell upon the river, and the name of the star was Wormwood. And many men died." With the help of a pastor, Dean learns that the omens are a prelude to the Four Horsemen of the Apocalypse, specifically War. Castiel tells the Winchesters that the Bible gets more wrong than right, and that the Antichrist isn't Lucifer's child but rather a demon spawn. The Bible never actually names the Antichrist as Lucifer's child, that is more an interpretation of popular culture. 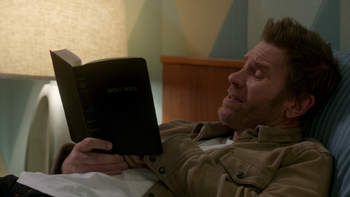 Bobby is looking through a Holy Bible to discover what Lucifer is planning in Carthage, Missouri. Bobby reads through Revelation to explain how the dead are rising in Sioux Falls. They soon realize that Death is raising the dead to send a message to Bobby through his dead wife Karen Singer. In Bobby's subconscious, he remembers that he hid a cross in an old King James Bible. While in possession of President Jefferson Rooney, Lucifer is forced to lead a group prayer after the death of a Secret Service agent. Gripping a Bible in one hand, Lucifer's anger at having to pray causes heat to emanate from him. Later when trying to convince Kelly Kline that President Rooney is actually Lucifer and her Nephilim child is an abomination in the eyes of Heaven, Castiel has Kelly place her hand on a Bible, which instantly bursts into flames. When stopping at a motel for some rest before getting back to the Men of Letters Bunker, Dean tosses Jack a Bible as an alternative to watching cartoons. Jack opens the book and begins reading. Later, while eating dinner, Jack tells Sam and Dean he noticed that the book mentioned his father, Lucifer, in it. He begins questioning them about how they know his father as well as God, whom he realizes is his grandfather. "But the Pharisees and the lawyers rejected God’s purpose for themselves, not having been baptized by John." Lucifer lies on a motel bed looking through a Bible, scoffing at all the things it has wrong, and wondering if anyone fact-checked it. He also reveals that God had stolen some of his best lines. When Santino Scarpatti talk to Sam and Dean in his estate, a Holy Bible can be seen on a pedestal on a table in front of the Winchesters. "Hith-'o-rehr, shqodh ki'o-yivkha has-sa-tan, k'ar-yeh sho-'ehgh, mith-hal-lehkh, u-mvaq-qehsh 'eth asher yval-leha'." "Be sober, be vigilant, because your adversary the Devil, as a roaring lion, walketh about, seeking whom he may devour." This page was last edited on 6 April 2019, at 08:41.